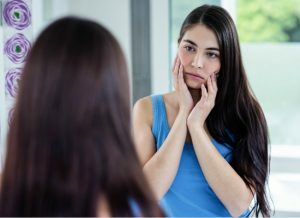 Body Dysmorphic Disorder (BDD) is a serious and treatable disorder in which people spend a lot of time worrying and ruminating about their perceived flaws in one or more aspects of their physical appearance. To others, this flaw is either nonexistent or minor. People with Body Dysmorphic Disorder believe that they look disfigured, abnormal, ugly or deformed. They think about their appearance at least an hour a day. The obsessions which are intrusive and unwanted are not driven by vanity. Their perception of their appearance may lead to shame, anxiety, despair, overly critical thoughts about their appearance and even self-hatred. They begin to avoid social situations and leave the house less often. They may obsess over their appearance and body image looking in a mirror and/or other reflective surfaces and spend excessive time grooming. Issues regarding body image can be very impairing. They spend 3 to 8 hours each day engaging in repetitive compulsive behaviours that are intended to inspect, hide, compare or seek reassurance about their disliked body parts. The compulsive behaviours may provide a sense of reassurance or relief but they are unhelpful because they often cause an increased anxiety and maintain BDD symptoms. People with BDD may seek out others reassurance and seek out unnecessary cosmetic surgeries or other cosmetic treatments to fix their perceived flaws because they see their problems as something physical that needs to be changed. Unfortunately, BDD is underrecognized and underdiagnosed and it is not that uncommon. People with Body Dysmorphic Disorder may not speak about their body image concerns with friends or family and even when they are seeking mental health professional help because of embarrassment, fear of being judged negatively or thinking people would not understand. Body Dysmorphic Disorder affects people at almost any age, often beginning around age 12 or 13. It affects both men and women almost equally. Body Dysmorphic Disorder treatment involves Cognitive Behaviour Therapy and often medication. Cognitive Behaviour Therapy is the only psychological treatment for Body Dysmorphic Disorder that is supported by research. Treatment will focus on learning how negative thoughts, emotions and behaviours maintain the problem and it will involve learning to view your appearance and your life differently. You will slowly learn more realistic thinking about your body image. The goal is to improve your quality of life and lessen the distress caused by your appearance-related concerns. You will learn how to manage urges and to reduce reassurance seeking and checking. Some medications may help control certain symptoms of Body Dysmorphic Disorder. One type of medication called serotonin reuptake inhibitors (SRIs) are antidepressants that are considered the first line medication treatment for Body Dysmorphic Disorder.